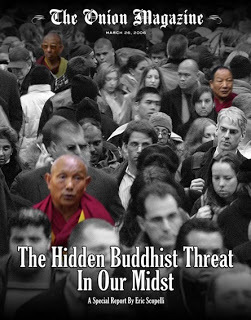 Transcultural Buddhism: The Buddhists are coming! "...Many Buddhists as well as Evangelicals may be surprised that an Evangelical like myself would be glad the Buddhists are here. The history between our movements in the States has been fraught with difficulties in that we are often on opposite ends of the culture war spectrum (Kyogen alluded to these tensions when he introduced me). Then there is the traditional Evangelical claim that “Jesus is the only way,” a view I hold. So, why would I say I am glad the Buddhists are here? No such thing as Tibetan Buddhism? Helping others does you good.